Standing on the floor of the Newseum in Washington, D.C., last week, in a crush of hundreds of past recipients of The Pulitzer Prize, was thrilling and humbling. We were assembled for a group photo as part of the yearlong celebration of the Pulitzer’s centennial. It was a chance to reconnect with old colleagues and meet other journalists with whom I share the experience of receiving journalism’s top prize. They say timing is everything. I’m a business beat reporter who has been fortunate to spend the better part of my career specializing in coverage of two rich topics of global importance. In each case I started off routinely covering a Fortune 50 corporation for the business section of a daily newspaper. And in each case, the corporation I was assigned to cover found itself pulled into the eye of a storm that no one saw coming. As a business beat reporter covering that corporation, I had a ringside seat. In 1988 I joined The Seattle Times to cover The Boeing Co. For the next 13 years I wrote a lot of stories about airplane orders, leasing deals and competition against Airbus and McDonnell Douglas. But then something happened. Boeing jetliners, in certain instances, would fail catastrophically. And in chasing down these high-profile product liability stories, I found myself immersed in the first great beat of my career: aviation safety. I investigated catastrophic failures in 747 cargo door lock sectors; 767 thrust reversers; 747 engine mount fuse pins; 757 ground proximity warning sensors; 747 fuel tank wiring systems; and MD 80 horizontal stabilizer jackscrews. The reporting for which I received the 1997 Pulitzer Prize for Beat Reporting, and 11 other national journalism awards, examined a profound design flaw in the rudder actuator of Boeing 737s, the world’s most widely flown jetliner model. That work began when USAir Flight 427 flipped into the ground on approach to landing in Pittsburgh, on Sept. 8, 1994, killing all 132 people on board. Though my byline subsequently appeared on more than 200 rudder stories, I worked with a team that included our senior managing editor, my business news editor, a writing coach, photojournalists, graphic artists, librarian researchers and other reporters. Crucially, we had the staunch backing of Seattle Times publisher Frank Blethen. We disclosed how Boeing was fully aware of a design flaw that could trigger uncommanded movements of the rudder into a hardover position. This would flip a 737 into an accelerated dive. Pilots did not know this was possible, and so were unaware of flying procedures they could use to minimize the effects of an unexpected rudder movement on approach to landing. And they had no training in emergency maneuvers they could use to counter an uncommanded rudder hardover at altitude. Boeing had spent decades denying the rudder design was flawed, and rejected any suggestion that it came into play in a long string of rudder-related crashes and mishaps. The company systematically attempted to shift blame to the pilots. Our coverage showed how Boeing took proactive steps to misdirect Federal Aviation Administration and National Transportation Safety Board inspectors investigating rudder failures. Not surprisingly, the company sought to discredit my stories. But in the end, Boeing redesigned the 737 rudder actuator. Today all U.S.-registered 737s use the redesigned rudder, and 737 pilots flying vintage models (for instance, developing world charter flights) have been trained to use special procedures to minimize the effects should they experience an uncommanded rudder hardover on approach to landing. It turns out winning a Pulitzer isn’t too bad for your career. In late 2000, I joined USA Today to cover Microsoft. I wrote about how Microsoft developed and licensed software, its successes and failures competing against innovative rivals, and its tussles with antitrust authorities in the United States and Europe. But then something happened. Hackers began to probe Microsoft products for coding flaws. Specifically, they went after the Windows operating system. And just as the 737 was and is, by far, the most widely flown jetliner model, Windows was and is, by far, the world’s most widely used PC operating system. By 2003, Windows began to get overwhelmed with viruses and worms. Bill Gates’ life work was suddenly under malicious assault by hackers, who at the time, were mostly motivated by bragging rights. And so I began covering the second great beat story of my career: cybersecurity and privacy. Again working with a dedicated support team at USA Today, I wrote about globe-spanning worms, like Blaster, SoBig, MyDoom, Sasser and Conficker. We delved into explaining botnets and carding forums. And we shed light on how the tech and financial industries combined to make it all too easy for the bad guys. In 2014, I left USA Today and accepted the position of Editor-In-Chief of ThirdCertainty.com. As we fully disclose, the content you see on this website is underwritten by IDT911, a privately held company in the business of supplying identity theft and data breach recovery and response planning services to individuals and companies. Our mission is to serve a targeted audience of nontechnical company decision-makers—especially at companies with 50 to 2,000 employees. We want to help companies better understand emerging security and privacy exposures. We are just getting started tackling topics that cry out for deeper journalistic review. It’s nasty out there. Nefarious activity on the Internet continues to steadily worsen. Cyber criminals are like kids in a candy store extracting money, exfiltrating data, evading detection and refining methodologies with very low risk of getting caught. Cyber crime is on a steadily rising curve that has surpassed global drug trafficking and has begun to materially impact global domestic productivity. And, once again, I find myself working with a dedicated team of editors, reporters and support staff. And, once again, I have the great good fortune to have the staunch backing of an enthusiastic publisher, Adam Levin, who understands, as Joseph Pulitzer did, why producing quality journalism is important. 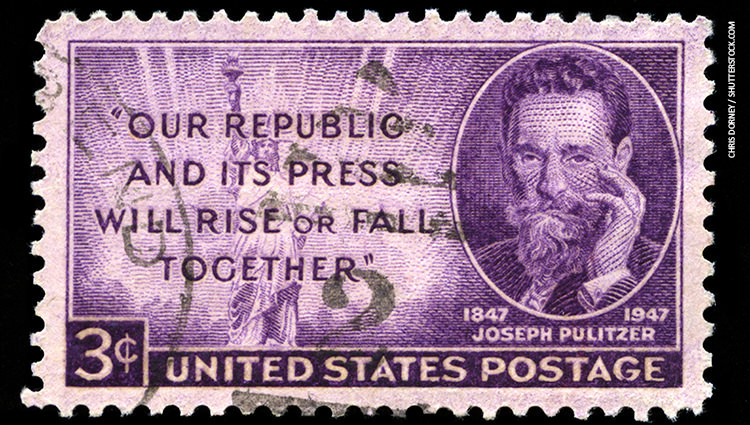 “Our Republic and its press will rise or fall together,” Mr. Pulitzer once said.